Masbagik is a wonderful Sasak village located on the East side of Lombok. It’s been there for many years and is famous for the top-class pottery products. 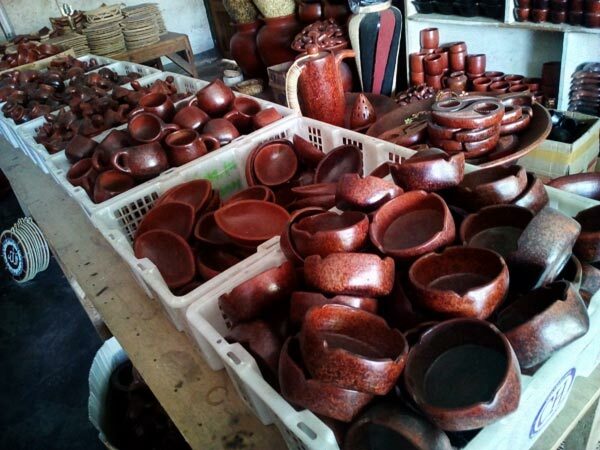 If you’ve been keeping up with our reviews, then you already know that this island is known for the communities that make a living on pottery. The Masbagik village is no exception. The first thing you’ll notice once you step foot there is that almost no fellas are involved in the process. Most of the workers are ladies, and they’re not that young. Yes, this craft takes many years to master, and that is exactly why the novices don’t have an access to the materials. Plus, everything is done by hand, which means every single item is unique. There’s a river flowing right next to the village; the women use it to collect the mud. By the way, the ovens are extremely hot, and they are also operated by the ladies. For the clay to set, you need a certain (very high) temperature, which makes these ovens kinda dangerous for the foreigners. So, don’t ever touch them – might get burned! Alright, what about the men of Masbagik? If the wives are doing all the heavy lifting, then what are the husbands up to? Well, they usually find work overseas. Or, they just do nothing and stay at home 24/7. That’s how it’s been for many years, and I don’t think this “tradition” is going to change anytime soon. Besides all that hard work, the women also find the time to teach their kids the art of pottery. Teaching is not easy, and the masters have to make sure that the techniques and methods of their ancestors will never be forgotten. In communities like this one, children rarely if ever go to colleges and/or universities. They learn everything from their elders and know in advance that no matter what happens, pottery will always be a huge part of their lives. It might be hard for you to imagine that living in a big city somewhere in the United States or in Europe, but that’s how it is in Masbagik and other “craft-orientated” villages in Lombok and all over Indonesia. The children of fishermen learn how to fish, the children of the weavers learn how to weave…you get the idea, right? The women of this fine village specialize in making beautiful plates and clay ovens, those are in large demand. Naturally, they can make many other objects as well, and you’ll be amazed by their sleight of hands. It takes them very little time to create something out of mud, and many tourists visit this place only to watch the professionals work. You won’t be able to see any of that back at home! Clay is perfect for creating all kinds of shapes. For example, one of the women showed me how to make a vase from clay. It took her only five minutes to make it! Now, you might think that the locals sell these products to the neighboring villages and/or the government like in most countries, but that’s not really the case here. Usually, the villagers barter them for something that they don’t have. Food (including rice, vegetables, and sugar), kitchen tools, and clothes – you name it. These communities don’t really need money to trade with each other. I know, it sounds like these people never made it out of the Stone Age, but there’s a lot of sense in what they’re doing. Besides, this is the life they know, and while the government is doing everything in its power to make them more civilized and up-to-date, the people of Masbagik and the other villages simply don’t want to leave their ways behind. Don’t get me wrong: there are many supermarkets, stores, restaurants and cafes in this place. Still, Masbagik is miles away from what you’re used to living in the Western World. And from that standpoint, it is a very attractive place if you’re all about new experiences and getting in touch with cultures and communities with their own set of rules. There’s something unique about every single town/village/community in Lombok – that’s why it’s so popular among tourists. As for Masbagik, it’s not the prettiest of them all, not even close. On the other hand, it’s one of the most interesting spots because of the secluded lifestyle and lack of modern-day developments. So, what can an average tourist do in this village apart from admiring the local masters? Not much, really. There are no beaches around, and the Rinjani Waterfall is far away. And because this settlement is not being positioned as a resort town or anything like that, you won’t have as many options available as you would in a different village/town. Keep that in mind and book a room before you leave home. With that said, there are still many nice and quiet housing options for a wide range of budgets. For 10-20 bucks a day, you’ll be able to rent a beautiful hotel room (with beds for two, three, or our people). The Masbagik village won’t be able to entertain you for a weak or even for a couple of days. But if you’re in Lombok doing some sightseeing and want something more “exclusive” and exotic, then, by all means, check it out when you get the chance. The potential visitors need to understand that. Otherwise, they risk being disappointed. The prices of food are also quite affordable – you might already know that if you’re a frequent guest in Lombok. The local meals are delicious, and the service is top-notch, even though not every single waiter/waitress speaks English that well. Make sure to try some of the fish dishes – they are very tasty. Historically, the eastern parts of Lombok have always been the poorest. Thankfully, the hills provide the necessary clay for production. Besides, even though I did just say that selling goods is not a big source of revenue, it’s clear that pretty soon Masbagik will start to benefit from the very land it’s standing on. Fair Trade is slowly but steadily giving this village a chance to connect with the outside world and offer its craft to the foreigners. And, the government of Indonesia is doing a lot to make sure these folks have an easy access to the international market. The Sasak people are used to take care of themselves without any help from the outside world. They give the earth beautiful shapes. The hands craft the items, while the feet keep the pot spinning. And, even though there are some fancy new electric wheels that make it easier to do the job, these women still prefer the old-school techniques. The cups, jars, pots, and other water vessels will serve as great gifts to your friends/loved ones. Oh, and by the way, the jars (especially the tall ones) are not only used as décor but also as some sorts of air conditioners at the village. All you have to do is fill them with cold water and put in the room next to you. Alright, last, but not least, let’s see how we can get to Masbagik. Lombok is a pretty big island (it has a total population of over three million people) and it’s super-easy to get lost there, especially if you don’t know the language (which I assume you don’t). The road from the Lombok Airport to our destination will take more than an hour – 1.10/1.15. It’s approximately 36-41 kilometers long. As always, you’re free to pick between renting, hiring a taxi driver, and hopping on a public transport. The latter is no fun at all, but if you want that 100% “raw” experience, then a public bus is your best bet. They are pretty slow, though J. A taxi is the most expensive option. But, the locals know their way around the island and will take you wherever you want in no time. Finally, consider renting a car or a motorbike to enjoy Lombok while behind the wheel. Remember: GPS doesn’t always work, which means it would be wise to take prints of the map with you before you land. The route is actually pretty straightforward: start in Jl. Raya Praya and switch to Kopang. Jl. Raya Mataram comes next. From Sikur, turn to Jalan Kesik. Ok, that’s it! Personally, I hired a taxi and had a great time doing some sightseeing while in the back seat. Masbagik does look like a third-world country village, yet, like you said, that's a huge part of its charm. When we got bored of the beaches and parties, we decided to pay this "ancient" village a visit. It's got a very Asian atmosphere, even though all the locals are Muslims. If pottery is what excites you, the skills of these women will take your breath away. Take a second to applaud their hard work! Not the most exciting spot in Lombok. The village is poor, and no fun at all. But the villagers seem to be pretty happy with their lives. If you're in Lombok to check out the temples, waterfalls, and beaches, don't forget about Masbagik. It's not as pretty, but might just be the most memorable part of your trip.